The Hawthorn Football Club competes in the Australian Football League (AFL). 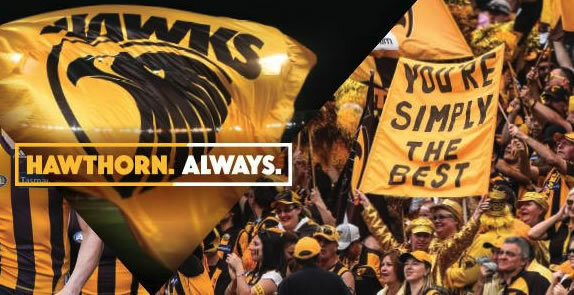 The Hawthorn Football Club has a proud history, having grown from a small suburban club to become a power club of the expanded national league. The Hawks' started at Glenferrie Oval joining the VFL in 1925. The Mayblooms (name before the Hawks) became the perennial whipping boys of the competition. In 2006, Hawthorn's training and administration facilities were relocated to Waverley Park. Since 2007 Hawthorn have played 4 games a year at York Park in Launceston, Tasmania, with the remaining games played at the Melbourne Cricket Ground (home ground). 13 Premierships, 5 Brownlow medals, 8 Norm Smith medals and arguably the two best full forwards in the history of the game. Hawthorn has a proud history, having won 13 VFL/AFL premierships since joining the VFL in 1925. Having not won a premiership prior to 1961, the club is the most successful club in the modern era having won in 1961, 1971, 1976, 1978, 1983, 1986, 1988, 1989, 1991, 2008, 2013, 2014 and 2015. The Hawks Museum tells the story of the people that have made the Hawthorn Football Club the most successful club in the last 50 years. Relive memories of Glenferrie, Princes Park and Waverley with memorabilia and Honour Boards from our former home grounds, the Social Club, the Trainers' and the Past Players' Rooms. The club's Latin motto is spectemur agendo "By our deeds we shall be known". See below for official and unofficial club web links.